Just one week after they captivated audiences in the FIFA Women’s World Cup final, the U.S. and Japan were squared off again – this time on the baseball diamond. 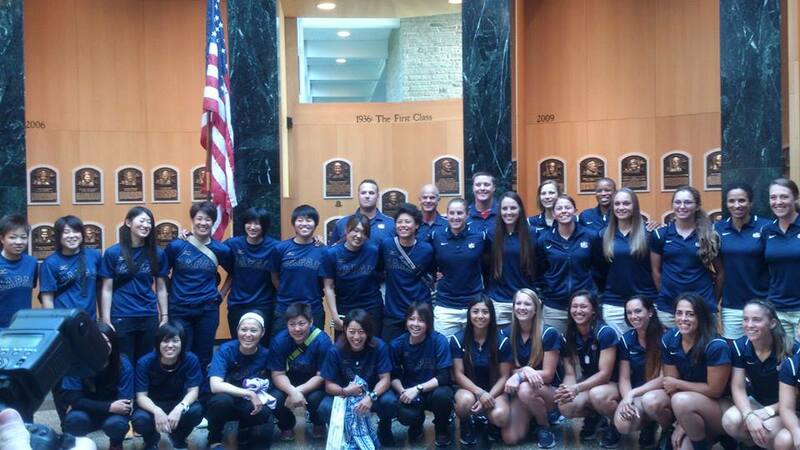 The U.S. women’s national baseball team and the Madonna Stars of Japan played four game friendship series in the first-ever Cooperstown Women’s Baseball Classic initially at Suny Cobleskill Field and 3 games at Dobleday Field in Cooperstown from July 10, ending with both teams tallying two victories. On Friday, July 10, both USA and Japanese teams paid a scheduled visit to the National Baseball Hall of Fame and Museum in Cooperstown, the home of baseball, as part of their participation in the Classic. The teams were greeted by Museum President Jeff Idelson and Brad Horn, Vice President of Communications and Education, and were shown The Baseball Experience film in the Museum’s Grandstand Theater before touring the rest of the Museum. Before the film began, a player from each team presented a baseball to the Museum. It was a special experience for players of both nations, who share a commonality in their passion for baseball. Japanese pitcher Risa Nakashima said she and her teammates were excited to learn about the history of a game that eventually captured the imagination of so many youngsters in her home country. Similar to the sport of women’s soccer, the U.S. and Japan have a recent competitive history with one another. Last September, host Japan defeated Team USA in the Women’s Baseball World Cup final, marking its second straight defeat of the U.S. after it also prevailed in the 2012 final. Overall, Japan has won the last four World Cups and is currently rated No. 1 in the International Baseball Federation world rankings. The U.S. is ranked second. The contest on Sunday, July 12, a 6-2 victory over Japan's Madonna Stars, marked the USA Women's National Team's final game in the USA, before it heads to Toronto to continue training for the Pan American Games. Team USA will scrimmage Canada on Thursday before its opening game of the tournament against Venezuela on Monday.